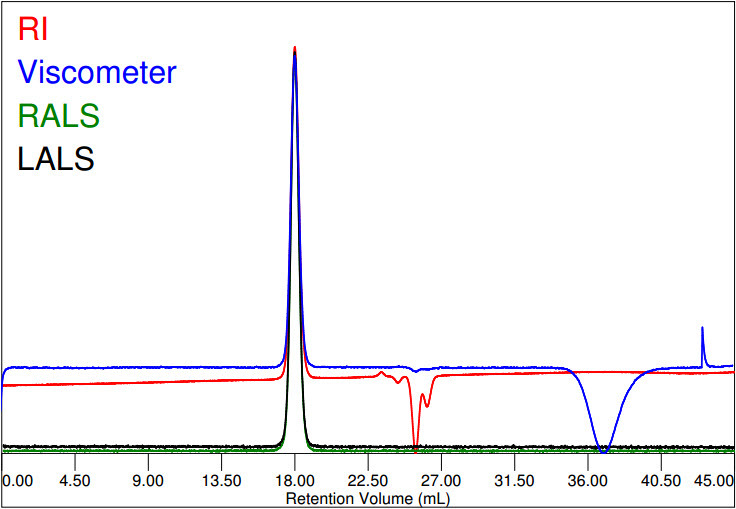 Here is an example chromatogram of polystyrene in THF. The run conditions and some results are detailed in the table below. Wikipedia: Polystyrene is a synthetic aromatic polymer made from the monomer styrene, a liquid petrochemical. Polystyrene can be rigid or foamed. General purpose polystyrene is clear, hard and brittle. It is a very inexpensive resin per unit weight. Uses include protective packaging (such as packing peanuts and CD and DVD cases), containers (such as “clamshells”), lids, bottles, trays, tumblers, and disposable cutlery. This is a typical narrow polystyrene (often also abbreviated as PS) sample of the type that is used to calibrate the system for inter-detector delay, band broadening and detector constants. Polystyrene standards are available in convenient “just add solvent” kits for easy use in chromatography. In this data set, both the 7º (LALS) and 90º (RALS) light scattering signals show very little noise due to the clean nature of the sample. There is a slight trend in the RI signal due to temperature equilibration.